Marvelous Multiagers! : Free Postcards from Vistaprint! I know that I have read about Vistaprint's free products many, many times on other teachers' blogs, but in case you weren't familiar with the website, you should check it out! Right now they have a ton of June deals that will expire on July 4th. Business cards, postcards, magnets, notepads... the list goes on. You do have to pay shipping, but it's really not terrible. I wanted to show you the super cute postcards I ordered today! I borrowed this idea from What the Teacher Wants. 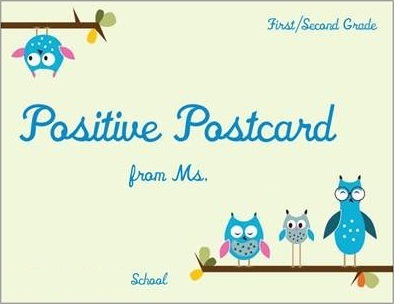 Periodically, I will mail a postcard to a student's home to recognize his or her great behavior, good choices, increased effort... you understand. This postcard was super easy to make with their templates and fonts, and it only cost me $6.46 for 100! That is 6 cents per postcard! Hard to beat that price. I'm grabbing your ultra cute button while I'm here too! I have a question for you. How did you get the name of your blog to automatically show up and link back in your posts on other blogs? Thanks!!! Ms. M made my button for me, she is the bomb dot com. Thanks for posting about the giveaway! I did Vista Prints too! I cannot wait to get it in. Thanks for visiting my blog! You can create your own Donors Choose idea to get a projector! I am switching districts and pray that they have as much technology as I just came from! As for Vistaprint, I just did the free business cards, but didn't see free postcards...I guess I have to go back! Thanks for linking up! I love your postcard! The QuantumPostcards can be used by the marketers who want to promote their business in the market. There are numerous designs available that will respond to your needs.